The women of Australia are currently bombarding their Federal Minister for Immigration and Border Protection, Scott Morrison, with tampons and maxi pads. But it's for a cause! Morrison's office has denied the reports, and Chilout, an advocacy organization against the detention of children, couldn't corroborate. But a feminist group called Destroy the Joint asked women in Australia write to the MP—and to include (unused!) tampons and pads to make sure he got the message. 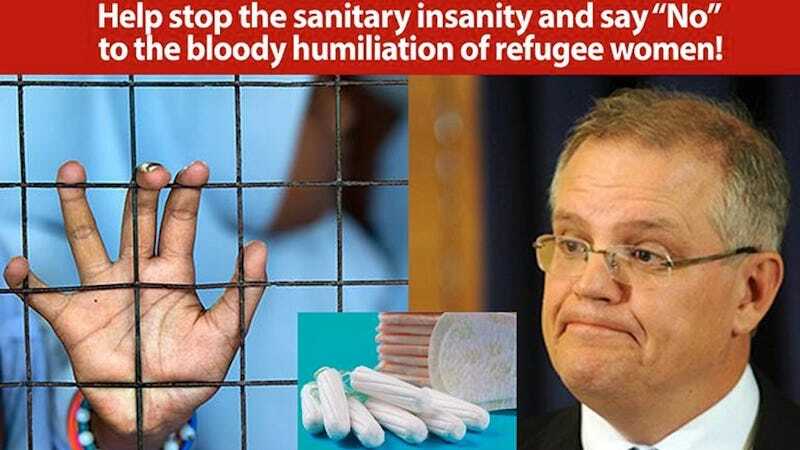 Their demand: "The first thing Morrison can do is ensure all those who need sanitary products get them in good supply, whenever they need it without having to ask a guard. Period." One of the organizers told the Sydney Morning Herald that it wasn't just about the tampons, either: "The issue is that there is a continued attack on the health care of women in our detention centres. Tampons are a symbol of a lack of health care ... it's symbolic of the terrible health care that our asylum seekers and refugees get across the board."